Not everyone has what it takes to be a relevant and influential part of today’s 21st century, business world. In this day and age it isn’t merely enough to be a diligent worker; you also have to be an eloquent speaker as well as a practical person. The equation is rather simple, if people find your work credible then they will invest their hard earned money in you, however if they do not, then no amount of persuasion can make them change their opinion. 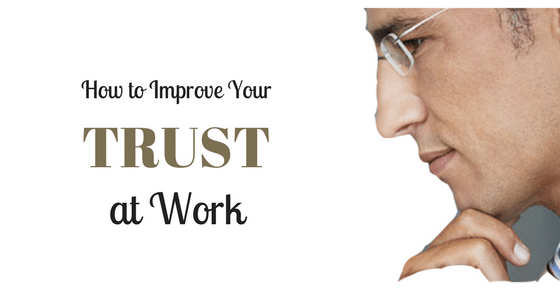 Here are some ways by which you can improve your trust at work so that you can quickly reach the top of your respective field. There are numerous individuals out there who take up a number of projects but fail to complete them on time. The first important step towards improving your credibility at work is by making sure that you respect deadlines at all times. Occasionally, we all might fail to complete a task or two on time, however if this is a recurrent thing, then people will eventually view you as a laid back worker. When it comes to promotions, one of the first things that the seniors consider is whether or not the individual completes tasks at hand, on time. It is important to remember that while working, one should try and focus all your attention on that piece of work. If you do not concentrate then a task that could have been completed in say one hour will inevitably take longer and the quality of the output will not be top notch. It is bad enough to arrive late for a lunch or dinner plan with a friend but it is even worse when you arrive late for work. Showing up late is not only extremely unprofessional but it also causes immense stress. Nothing increases your credibility at work that arriving on time, consistently. Arriving early silently communicates to the seniors at work that you are a responsible person who takes his or her work very seriously. It is of paramount importance that you are well dressed when you show up at work. Coming to work looking disheveled and unkempt is not just a bullet to your credibility but it has also been psychologically proven that “when you don’t look good you don’t feel good as well”. No one says that you have to spend half your salary buying expensive, branded clothes but you should at least make sure that you look presentable at all times. Clients can walk in at any time while at work and they will get an extremely bad impression if you are in flip flops or you look untidy. Though it is important to let your work speak louder than your clothes, yet you cannot entirely ignore your appearance. Many harbor the misconception that messy people are usually the creative and gifted ones. However this does not hold true in most offices, if the seniors at work see that your desk is constantly cluttered and all your important documents are either dog eared or crushed then they will naturally come to the conclusion that you are an irresponsible person who is not mature enough to respect important business documents. To make sure that you create a good impression you should try to ensure that you neatly file all your papers at the end of the day and that your desk is neat and tidy at all costs. An important part of improving your credibility at work is by making sure that as far as possible you keep your personal problems at home. If you are experiencing some distress at home then sometimes it is alright to share your woes with your colleagues, however if you constantly washing your dirty linen in public it is extremely undesirable at the workplace. One of the biggest mistakes that you can make is constantly receiving personal calls at work. You might think that nobody notices but your boss surely does and you can rest assured that he does not approve of such behavior. In an attempt to please your boss people often instantly agree to undertake a project without actually weighing and considering how much work that project really entails. Your seniors will never respect you any less if you simply tell them that you will get back to them as soon as possible , pertaining to whether or not you will be able to complete the task. There is nothing worse than undertaking a task, promising to complete it on time and then sheepishly admitting later on that it was much more complicated than you thought it was going to be. It is never a good idea to trample over others while climbing the ladder of success. One can never go very far by using unfair and unethical means. A chief consideration seniors make while thinking of promoting someone is by seeing if the person is a team player or not. It is unlikely that they will grant a promotion to someone who is selfish and does not get along with his or her colleagues. Being an honest and sincere worker will naturally make you well liked in your work place and improve your credibility as well. In any work place quality is perhaps given more weightage than quantity. Many people think that if they do a great bulk of work (no matter how well or badly) that they are creating a good impression. Concentrating on a number of tasks at one time does not necessarily show that you are good at multitasking. You should never compromise with quality of your work. You should always strive to strike that perfect balance between quality and quantity so as to ensure that people at work take you seriously. As human beings, we all make mistakes, no one is perfect. It is important that once you have made a mistake you accept it and move on. However post committing an error it is important to not become vulnerable and start second guessing yourself. If you doubt your own abilities you are doing nothing but feeding your own insecurities and making yourself weak. No matter what, you should stand by your decisions, be mature enough to accept criticism and hold your head up high. Experimenting or trying out things for the first time might often end in failure but sometimes that risk is worth taking as it might lead to success. Once people at work understand that you never take decisions without weighing the pros and cons then they will respect you nonetheless and this respect will help improve your credibility. To be a relevant part of today’s business community it is very importance to be able to think wisely. It is important to be able to apply all the theories you have learnt from books. One of the chief factors that helps increase your credibility at work is by being an efficient problem solver. When colleagues approach you with some problem you should not immediately start fretting instead you should try and think of a solution to that problem. It is not important to do all your work for personal gains however credit should be given where it is due. Make sure that you get yourself noticed as there are often some people in the work place who take praise for the work that has been done by other people. An impressive way of increasing your credibility at work is simply by speaking your mind and giving your honest opinion. Very often people tend you blindly agree with what the boss is saying because they would not like it to seem like they are challenging him or her ,however seniors appreciate it greatly when employees give their advice and present their views. There are plenty of ways to speak your mind without sounding egoistic and disrespectful. So if you believe that there is a better , more efficient or cost effective way of completing a particular project then putting forth your view could earn you a great deal of praise. In addition to this do not shy away from giving your inputs just because what you are saying might not be the conventional way of doing things. Being able to think out of the box is a gift that not everyone has and if you are one of those people with this rare ability then you should make use of it to the fullest. These were some of the simple things which you can do to improve your credibility at work. It is important to believe in yourself so that others can believe in you. Being able to trust someone is never easy so you should ensure that once people have placed their trust in you, do not let them down under any circumstances as trust once lost can almost never be regained.